MOSCOW, April 27. /TASS/. 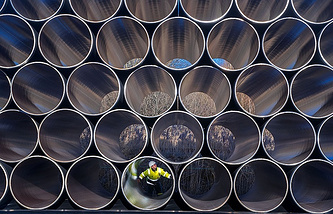 Gazprom plans to begin laying pipes of the first line for Turkish Stream gas pipeline this summer, according to the Russian gas holding. It was reported earlier that Gazprom has set up a branch of South Stream Transport B.V. in Istanbul to coordinate work on the Turkish Stream gas pipeline project in Turkey. Thus, all conditions have been created to start laying the marine part of the gas pipeline, he concluded. "In the second half of this year, we will start the laying of the gas pipeline and we plan to complete the construction of two lines of the Turkish Stream by the end of 2019. The drilling of the first section of the micro tunnel has been completed on the Russian part, the second micro tunnel is ready for 98.5%," Gazprom CEO Alexey Miller told reporters. Miller said that the Turkish Stream project was carried out strictly in accordance with the schedule. On the Russian territory the coastal junction of the Turkish Stream gas pipeline is located among the rocky cliffs that rise along a narrow sea coast. For the crossing of the coastal strip engineers, came up with a technical solution called "micro-tunneling." This method makes it possible to lay the gas pipeline without carrying out construction works on the coast. In February 2017, South Stream Transport B.V. affiliated with Gazprom awarded the contract for construction of the second line of the Turkish Stream gas pipeline’s offshore segment to Allseas Group. Gazprom signed the contract for construction of the first line of the Turkish Stream offshore segment on December 8, 2016. The Turkish Stream project envisages the construction of a natural gas pipeline via the Black Sea to the European part of Turkey to be further extended to the border with Greece. The seabed section is about 910 km and the mainland section through Turkey is 180 km. Previously the project was estimated at 11.4 bln euro. It is supposed that gas supplies via the first line will be totally aimed for the needs of the growing Turkish market. The agreement on Turkish Stream project was signed in Istanbul on October 10, 2016. 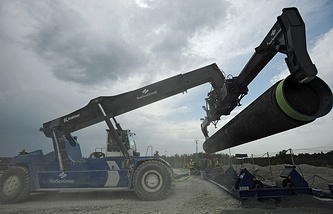 The sea section of the pipeline is being implemented by South Stream Transport B.V. (100% subsidiary of Gazprom).